You have decided that having a bird for a pet is definitely the way forward for you, the beautiful songs they sing and effortless appeal makes them an ideal addition to any family. If you are living in a space that is limited; or has no defining outdoor space; then a caged pet is probably the best choice for you. Your dreams of having an extra being in the household can be fulfilled. Birds are great companions and can give you many hours of pleasure, they are all individuals and have their own sweet personality which makes them even more endearing. 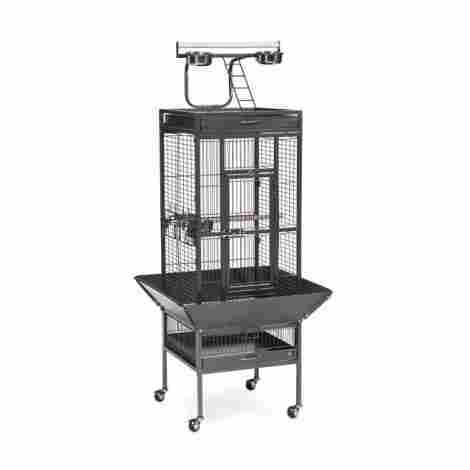 This recent review updated the top 10 best bird cages, presented to the reader ways to make their life easier when having a pet bird by including information about materials cages can be made of and cleaning tips. Included are some ideas such as where to place their new bird cage. First on your to-do list before you make the choice of which feathered friend you would like, is to make sure you have suitable and adequate living space to accommodate them. A light airy room is ideal, and spaces next to a window as long as it won’t be in direct sunlight is a good place. You should probably think about a protective mat for underneath where the new cage will sit, they are beautiful; but birds can create an immense amount of mess. When you decide on your particular favorite bird or even birds, you should seek advice as to the minimum space they need to live a happy and as unrestricted life as possible. For the same reason you wouldn’t put a Koi Carp fish in a goldfish bowl, or a rabbit in a hamster cage – the same has to be considered for a bird. They need ample room to move around in their cages, plenty of rests, toys, and food and water stations. Make sure your bird or birds have enough room to extend their wings without touching the edge of the cage or their toys. You should also ensure you have a cage with a secure catch or latch on too, birds can be very crafty and clever – especially if they have an eye on the door and window. Cages come in a huge variety of shapes and sizes. Also, they are made of different materials and will have various different features that can make cleaning and maintenance easier. This review and guide will provide invaluable information and reviews for the best ten bird cages, to give you a hinting helping hand when it comes to deciding what bird cage you require for a great home for your new pet. There is also a useful section on frequently asked questions that aims to answer queries that you may have, this is a guide only and for specific information or worries/concerns, you should always seek advice from an expert in the field. This travel bird cage measures in at 20 inches long, twelve inches wide and 16 inches high with a generous three quarter inch bar spacing. It is available in white and has a handy side access door giving the bird plenty of room getting in and out. It is specifically designed for travel purposes only and should not be used as a permanent home. The travel cage is functional and practical because it folds flat for easy storage when not in use. The accessories included are two stainless steel dishes and one wooden perch. The base is simply placed under the cage and is quick and easy to empty and change, the catch on the door is designed specially to stop the bird from being able to prize it open. The entire cage is a mere eight lbs in weight so won’t take too much to carry from home to care for the hardy traveling bird. It is snug enough to keep the bird safe and secure for shorter periods of travel and is suitable versatile for this reason. The price of this Prevue Hendryx travel cage offers a practical and versatile product that gives peace of mind for when any journey has to be made with the bird. It is stable enough to keep the bird safe and conveniently stores away flat when not being used. The Prevue Hendryx flight cage is available in three stylish colors; brown/black, blue/white and green/black. It measures a healthy 26-inch x 14 inch W x 36 inch H and has a half inch bar spacing, Prevue designed this cage to be suitable for parakeets, canaries, and finch, either in singles or even multiples. The room inside gives ample room for wing stretching, exercise and flying giving a better and happier environment for the bird or birds. The cage benefits from two good sized doors that allow easy access for the bird and for enabling a quick entry for filling food bowls and cleaning. The doors are both placed at different heights so it's easy to distract the bird through one door and enter the second with little hindrance. The package includes two handy plastic cups that are easily attached to the side of the cage and have large slots in the front of the lid to enable simple access to food and water for the bird. It also benefits from the inclusion of two horizontal lengthy wooden perches for a comfy rest and vantage point. The overall cost and value of this Prevue Hendryx Flight Cage are well reflected in both aspects, the quality workmanship and features that are included ensure great value that is designed to be fully functional and long-lasting. This beautifully designed wrought iron bird cage is not only available in four different sizes, it is also produced in eight striking and complimenting shades. Suitable for cockatiels it benefits from a quality build and structure that is designed to be durable and long-lasting. The unit is completed with a convenient seed catcher that reduces seed case dropping and makes cleaning the base a breeze. The stand is incorporated and has four wheels so is versatile enough to move around the house and combines practicality with functionality. The Prevue wrought iron bird cage is boosted with the additions including four stainless steel cups and two wooden perches. The cups are fitted with convenient attachments to the rear so they can be placed virtually anywhere in the cage. This cage has a useful heavy duty push button lock on the substantial door so there is less chance of the bird releasing the catch. There is a pet-friendly play top with a ladder for those moments of refreshing freedom and playtime for the bird. When considering the value of this Prevue wrought iron bird cage, taking into account the heavy duty and robust construction, combining that with the super range of practical accessories makes this cage’s cost well balanced, and is excellent value for money. 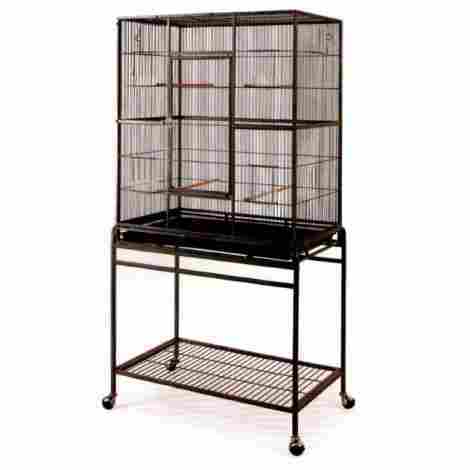 This large bird cage is produced using wrought iron for durability and longevity, it is available as a 61-inch cage alone, or as a 90 inch with a stand complete. 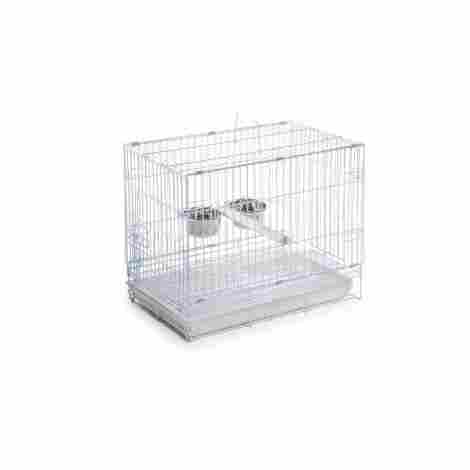 The cage has a robust push button lock that will stop the bird from escaping, it offers a suitable environment for finches, parakeets, cockatoos, cockatiels and parrots and benefits from a bar spacing of 7/10”. The stylish design is safely powder coated black which reduces the risk of sharp edges and rusting and is also easy to clean and maintain. The Yaheetech bird cage benefits from having four stainless steel bowls included, which are easily attached to the back of the cage in a variety of positions for the bird’s comfort. A further two wooden perches, a ladder, and a top perch are added for greater value. The entire unit (when purchased with the stand) is easily portable over flat surfaces, the four wheels boast being industrial spec and this provides a sturdy base that remains balanced even when being moved from place to place. 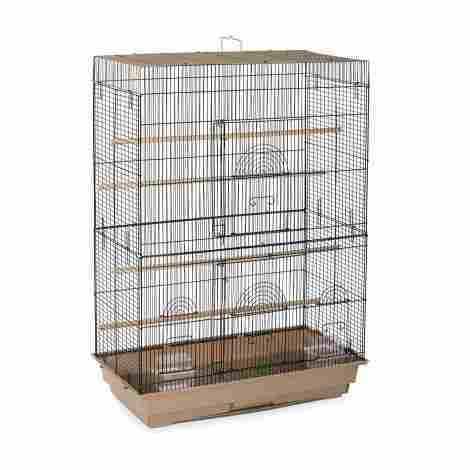 This cage is not the cheapest on the market, but when taken into consideration the wrought iron construction and the included bowls and perches, it is well balanced on both cost and value and is good value for money. The Vision 2 bird cage is offered in an array of four different designs and is available in as small, medium or large. It has been manufactured with small wires and each design benefits from a different colored set of accessories. These consist of green, blue and orange and are comprised of two water and food bowls that are attachable to the sides of the clear, fully enclosed base. It also has two twist on plastic perches that come in matching colors that correspond with each different design. The clear, full base reduces mess from seed, waste, and base covering making tidying less of a chore, and the entire top locks off so the bottom can be emptied without having to disturb the occupants. The easy clean coated wire is designed to be tough and is easy to clean and maintain. The addition of extra features will make this an ideal safe place for most birds, there is ample room for stretching, exercise, and flight for smaller birds who will be right at home in this stylishly designed bird cage. For the overall balance between both the cost in relation to the value, it is clear that this is a good buy for a basic cage. The easy cleaning attainable and the secure door catching system, ensure money spent on this is money well spent. 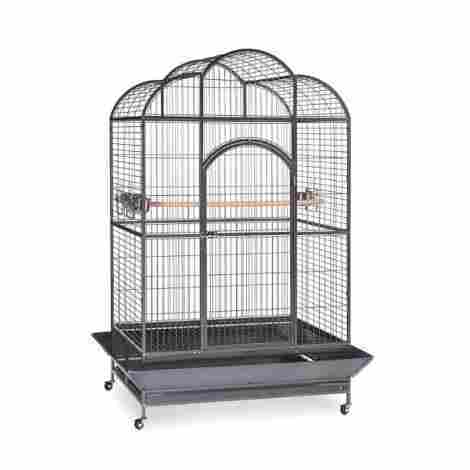 This super-sized wrought iron flight cage is suitable for canaries, parakeets and more. It is readily available with a stand included, the overall measurements are a substantial 32-inch long x 19-inch wide x 37 inches high without the stand, and a grand 64-inches high with the stand in place. It is constructed in strong wrought iron and is designed for a lengthy substantial life. The added benefit this offers is the versatility, it can be used with or without the stand so is suitable for most living areas. The bottom of the stand has a ready-made shelf that is practical for storing various related items such as food, treats, and cleaning accessories. It benefits from a large door that is securely latched with a metal safety lock. Included with the Mcage cage are metal ladders, metal shelves, plastic feeder cups and wooden perches – ideal because as soon as the product arrives it is virtually ready to become a home straight away. A great bonus is a slide out base tray for convenient cleaning. 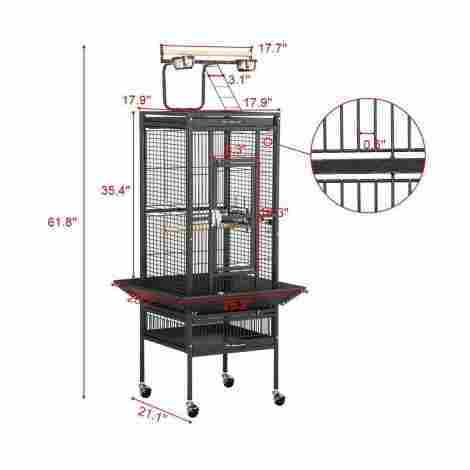 The overall cost and value of this Mcage large wrought iron flight cage are easily on an equal footing. The value provided with the stand, easy clean base and accessories ensure this cage is well worth the money and is the great value. The Prevue Hendryx Macaw Dome Top bird cage is designed to be a stylish and complimentary addition to any home, as well as being a safe and sound bird home. The Silverado colored cage is measured in at a grand 46-inch long x 36-inch wide x 78 ¾ inch height with a generous and suitable 1-3/8 inch bar spacing. It is constructed with wrought iron which gives it greater durability and a long-term resistance to rusting. The appealing dome-shaped top adds a touch of elegance to any room and serves as more than practical. The dome top cage comes complete with three stainless steel bowls that boast being nontipping by design, also as a bonus, there is a long wooden perch to attach so there is a ready-made home as soon as the product is delivered. The cage benefits from an easy clean pull out bottom and tray, it also has handy seed guards to protect the surrounding areas from too much mess. The inclusion of flathead hex bolts needed for the assembly is useful because they are virtually bird proof. This high-end value product is robust, practical and hard wearing, the whole unit is also easily moved with a wheeled base. The overall quality and construction of the Macaw dome top cage easily reflect adequately in both considerations of cost and value. 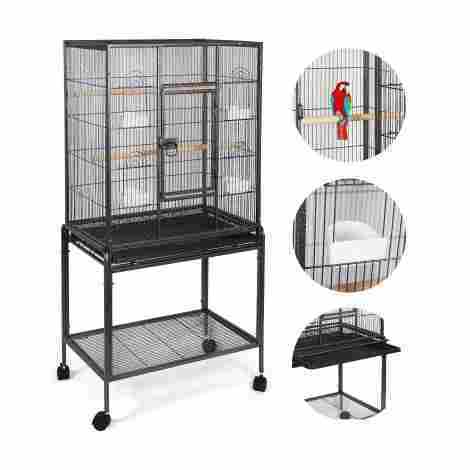 This substantial cage is suitable for larger birds like parrots, cockatiels and more. It comes complete with a stand and this gives it great versatility because it can be moved around on flat surfaces effortlessly. It is manufactured with a heavy duty metal frame which provides ample stability and a sturdy frame. The frame is specially treated with an anti-rust coating which is a real benefit for prolonging it’s overall life and reduces the risk of potentially dangerous rust build up. The Giantex cage has a handy shelf on the bottom of the stand for easy to reach accessories like toys, food and cleaning products. It also boasts a removable sliding tray for practical cleaning and maintenance. Included with this cage are four feeding cups that easily and quickly attach to the back of the cage in various positions, and it comes with two long wooden perches for immediate installation. It also benefits from having four useful feeder doors that can be securely locked. This large bird cage is functional and is available in three sizes, 53-inches, 61-inches and 68-inches making it suitable for a wide range of bird sizes. The sturdy manufactured cage is made with wrought iron for strength and durability. It has the benefit of being coated with a non-toxic powder and this increases the longevity of its life and helps to prevent rust. It has a robust door that is lockable so there is added peace of mind that pecking can’t inadvertently open the door unexpectedly. 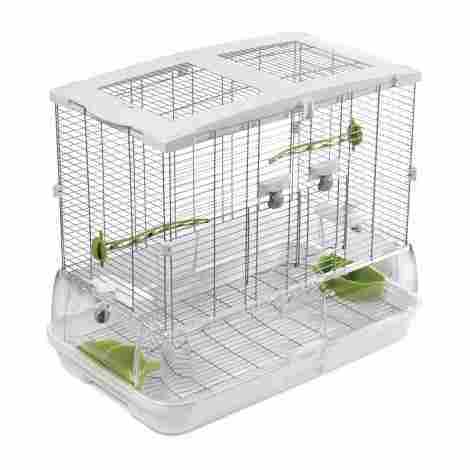 The cage comes complete with five stainless steel bowls with easy attaching hooks to the rear, it also has two perches and a longer wooden perch so there is plenty of resting space to get set up and go straight away. The top area has a handy play zone for the more adventurous birds. The bottom of the cage has a removable sliding sand tray that makes cleaning a breeze, and an all-round seed guard keeps the debris contained. The cage itself is easy to maintain and keep clean and the tough coating can withstand pecking for longer. When considering both cost and value, and taking into account the practical features of this cage, including the ability to be able to move it around on flat surfaces – it is not only fully functional but is money well spent and great for both cost and value. This functional Mcage flight cage is a double for great versatility, it has a handy removable divider so birds can be separated or joined as and when is necessary. It has a ½ inch bar spacing and this makes it ideal for most sized birds. The cages have a separate slide out bases and grills for easy cleaning and maintenance, making the essential jobs practically effortless. It has a double length shelf for handy storage and six strong wheels; so it can be moved easily on flat surfaces. The package comes complete with metal ladders, feeder cups, and wooden perches. The whole unit is easy to clean and comes away from the stand in an instant if required. The whole cage is coated with a non-toxic powder to help prevent rust and prolong its life. The overall size dimensions for the whole unit are a healthy 63 inches in length, 19 inches depth and 64 inches high. This versatile double flight cage is more than adequate to allow plenty of room for wing stretching, exercise and flying that encourage well being. The cost and value of this double flight cage are equally great and well balanced, especially when considering the overall internal area and the freedom it allows for the bird/s within. Money spent on this is definitely money well spent. You may be an avid and experienced bird keeper or you may be a novice and are wondering where to start your journey. If you have a bird already or have chosen one, you should be aware of the different types of bird cage there are available and that you choose carefully to make sure your bird has a happy home and a happy life. Stainless steel cages are notoriously easy to keep clean and safe for your bird, they are tough, remain rust free; are hard wearing and can withstand any amount of pecking. Being safe and nontoxic makes them an ideal cage, they are available in countless shapes, forms and sizes and last. And although they are more expensive, a high-grade stainless steel cage will be worth every penny. 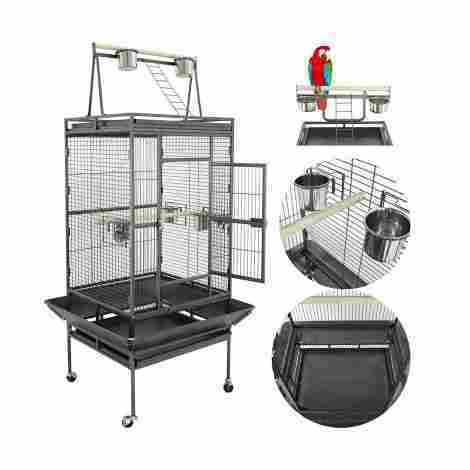 If you are looking for a cheaper alternative, then there are powder coated cages in a variety of forms and sizes, these don’t tend to be very durable and because the coating can be pecked at, it is vital to purchase one that has no toxins in the coating and is completely safe for a bird. For an in-between choice, you can find a vast array if plastic coated wire cages, these should again, be checked carefully to ensure the coating is safe and bird-friendly. Being easy to clean and maintain is a draw with these types, and they can be color coated so you can choose a cage to compliment your decor. Wrought iron cages are the heavy-duty members of the birdcage family, and as you would expect; they are durable, hard wearing and will last a very long time. These cages are expensive and can be heavy too – but if you decide on this type, keep an eye on it whilst you are cleaning to make sure there are no rust spots that may harm your bird. The type of cage you purchase obviously reflects the size of your bird/s and the space you have available. 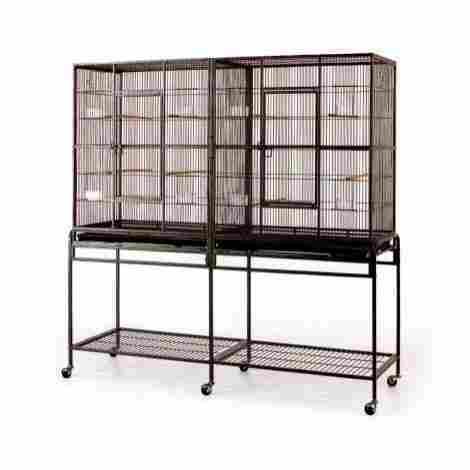 But if your cage is taking up a precious table, counter or dresser space then maybe you should consider a stand. If this is the way for you, then you need to think about a few things first, stands come in many forms and it’s important to make sure you choose carefully. The stand should be strong enough to cope with the combined weight of the cage, bird, accessories, food, and water without causing it to go off center balance. It is always good practice to check the maximum weight load for a stand you are interested in. Shaped and ornate stands are very appealing because they can complement any room, but you should make sure it is not in a position where it can be knocked over easily. You will also want to make sure it will not get blown over if there is a heavy wind. If you buy a four-legged stand you still need to ensure the frame is strong enough to take the anticipated weight, and that you have clearance around it so you won’t make your bird feel too enclosed. To help your bird have a happy life, you should buy better quality accessories for the cage, they spend a long time every day in there and it’s important to give them ‘something’ to do. There are a wide range of bird toys available, from bells, mirrors, ladders, swings, perches and even hanging treats. As long as you don’t overfill the cage and buy quality, toxin-free accessories your bird should be very happy. The same considerations should be taken into account when you are choosing feeding bowls and water containers. If space permits, birds would also enjoy a bird bath. Depending on what your bird is, and their individual diet – the feeding accessories should be just the right size for the cage and the food that will be in it. Some are clever and have specific hooks on the back of them so they can be hung from the side of the cage itself and hopefully away from any ‘falling’ debris. You need to keep your cage and everything inside it clean and well maintained to keep your bird healthy and happy. You can usually use a mild detergent to wash bowls, toys and the cage itself to reduce any build ups of harmful waste and bacteria. There are cage liners available too that make cleaning a little less tedious, as they can be lifted with the sand or sand sheet and simply replaced. You should always clean thoroughly on a regular basis though just to maintain the hygiene. Once or twice a week should be an adequate schedule to keep your bird’s living area hygienic. And if you’re worried your feathered friend could escape and disappear through your window, obviously don’t undertake thorough cleaning without a few cautionary steps first. Keep all doors and windows closed before you ‘go in’, and if necessary; purchase a large enough net to recapture your feisty friend. Another option is to have a smaller cage that you can encourage your bird into (by setting both open doors together), this will keep it safe and out of harm’s way whilst you get on with the cleaning. And this is an easy way to return them to their own daily cage as well without stress for you or your bird. As with any animal that is in our care, it is vital to make sure you get the feeding right. After all, the bird will be entirely dependent on you to cater for all its needs and requirements. As do all pets, it is a responsibility that comes with being a pet owner. Always check with an expert for the correct food to give your bird, and what amount is recommended on a daily basis. Some birds may enjoy the occasional treat – just like us and our furry friends, but you should always refer to specific guidelines to make sure what is safe. Some foods can actually harm certain birds and the last thing you want to be doing is putting your pet’s health in peril by slipping it a sneaky treat. Q: What difference does bar spacing make? A: It can be the difference between a safe bird or an escaped injured bird. Larger birds should have about one half to three-quarters of an inch spacing to prevent any painful accidents. Smaller birds should have respectively smaller spacings between the bars, birds are very good at squeezing through gaps or even attempting to squeeze through; so you should always seek expert advice on what breed of bird you have and the suitable cage with correct bar spacing. Q: What’s the difference between a standard birdcage and a flight cage? A: Standard cages are generally just that – a generic size that will comfortably suit a day to day use. It has been thought that restricting a bird’s free movement and wing expansion can lead to an unhappy bird. They are, by their very nature meant to fly. A flight cage is often oversized and has enough room not only for a bird to stretch its wings – but to fly as well. Generic cages are usually sized correctly to allow minimal flight and movement so will not harm your bird, but if you have space a flight cage is usually highly recommended for optimum bird health. Q: Are there any definite no-nos as far as a birdcage shape should be? A: Obviously the bigger the better, square and rectangular cages are the most popular and practical for your bird. The regular spacing of the bars helps to prevent your bird from getting trapped or injured. Oval and round cages often flute towards the top and/or the bottom, this means the bar spacing is irregular and reduce towards these points. This difference can lead to injury for your bird when it is stretching, flying, climbing and being energetic, therefore – these types should be avoided. Q: Are horizontal bars or vertical bars better? A: That can depend on a few things; first the size of your bird, and also cleaning are important considerations. Horizontal bars are good for climbing but can be tricky to clean as they are often spattered from above, and birds with larger wings could hurt themselves if they stretch out too close and bend a wing in motion. Vertical bars are easier and quicker to clean and tend to get less mess on them, but ultimately it is a personal preference that is key when matched with appropriate sizing. Q: What base is better when it comes to cleaning my cage? A: For practicality, a sliding base is a good choice because you can change the bottom of the cage frequently without causing too much disturbance for your bird. You can get bases that both slide and lock into place so there is less chance of it ‘riding’ out when you have an active bird. On a cautionary note though, if you buy a cheaper powder coated cage, the rubbing and friction caused by pulling and pushing the base can wear through faster causing damage and even rust. If you opt for a sliding base, it may be beneficial to spend a little more on a decent high-grade stainless steel model. Q: Why are Stainless cages more expensive? A: Stainless steel cages are more expensive because they tend to last longer and are more durable. They will be easier to clean than other materials cages are made of. Essentially, they have less maintenance and you will not have to worry about paint or plastic coating peeling or flaking off.